I've got a special treat for you. 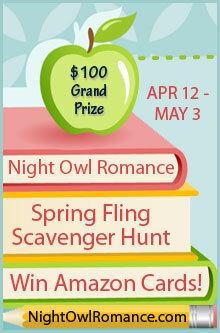 I'm one of the sponsors of the Night Owl Reviews "Spring Fling" Scavenger Hunt, April 12 - May 3. During this event I'm going to help you find some great new books. Make sure to check my featured title, Wet Kisses, out along the way. Other prizes include a book by each author and many other wonderful prizes to be announced soon! Good luck in the fling! Click here to Enter the Spring Fling Now!